Who Moved My Cheese? is self-help with a twist—its advice is illustrated with a charming fictional story! The characters of the story are two mice, Sniff and Scurry, and two mouse-sized people, Hem and Haw. These four characters live in a maze and spend all day looking for cheese. One day, Sniff and Scurry find a Cheese Station that has cheese! Later that day, Hem and Haw find the very same Cheese Station. The two groups head to the same Cheese Station every day (at different times) and eat the delicious cheese. But nothing lasts forever, and one day, the cheese runs out. How these four characters deal with this change is the take-home message of this book. We have compiled a list of actions that encompasses all the learning points from this book. 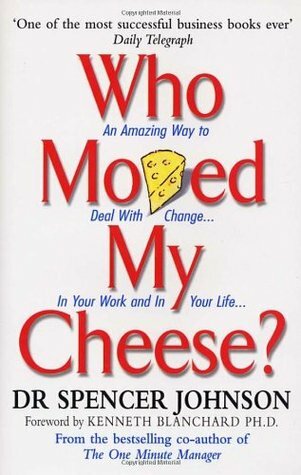 The major theme of Who Moved My Cheese? is that change is inevitable, and we must learn how to adapt to it in order to be successful. Thus, the actions revolve around achieving success, and are mostly tips that will help you adapt to new changes, whether in your personal, familial, or work life. Try even one or two of them out, and you will see immediate positive changes in your life. Spencer Johnson, M.D. left behind a medical career to write short books about life. Over 50 million copies of Spencer Johnson’s books are in use worldwide in 47 languages. Ken Blanchard, one of the most influential leadership experts in the world, is the coauthor of the iconic bestseller, The One Minute Manager, and 60 other books whose combined sales total more than 21 million copies. His groundbreaking works have been translated into more than 27 languages and in 2005 he was inducted into Amazon’s Hall of Fame as one of the top 25 bestselling authors of all time. Do not let your fears keep you from trying. Learn to adapt by changing your behavior and attitude.